Whether it's filled with mossy rocks and ferns or sands and cactus, a terrarium is an amazingly fun way to learn more about nature. 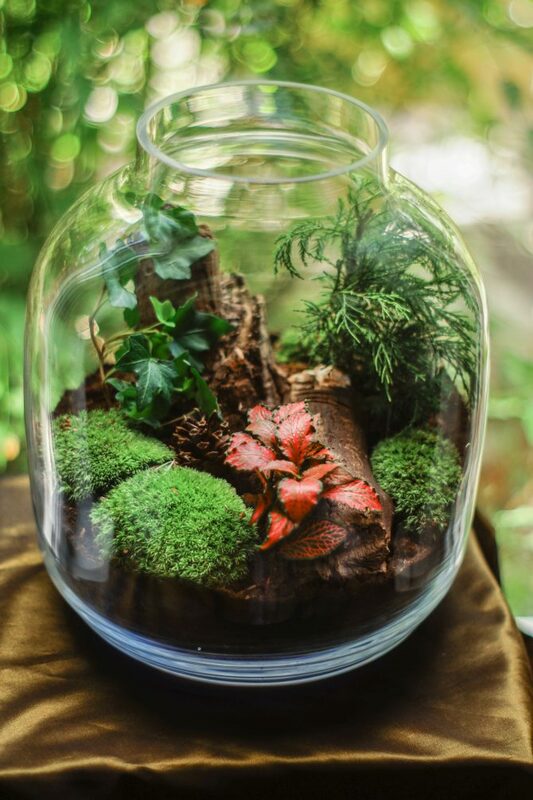 With a terrarium in your room, something of the outdoors can always be inside. Terrariums that feature plants (not animals!) lock water inside to keep the soil moist. When the plants transpire, they let out water vapor. When the soil gets warm, it lets out water vapor. All this vapor collects against the top and falls back as rain. A clear container that can be sealed to keep in the moisture. If you don't have a seal, plastic wrap and a rubber band will work. You'll want to use little plants for your aquarium—not corn that's as high as an elephant's eye. The kinds that grow in forest shade work well. Some favorite choices are wild strawberries, violets, and small ferns. Add a tiny china animal or gnome to finish the fairy tale forest look. Some people prefer to have their terrariums filled with sweet-scented herbs. Sweet woodruff and a low-growing mint are nice additions. Feel free to mix and match. Any small plants are worth trying. First off, make sure you are not adding any harmful stowaway critters with your plants and soil. Little bugs like to eat plants. While that's interesting to watch, it will definitely cut down on your plants' life expectancy. Now as to deciding to put a cocoon or a frog in there, you will need to learn all you can about taking care of them first so as to give them a good life and not a cruel and painful one. Begin by washing the container with anti-bacterial soap, rinsing it, and drying it thoroughly. Then take your container, and fill the bottom with about 1/2 inch of sand or pebbles. Next, add 1/4 inch of crushed gardening charcoal. That first layer draws the extra water away from the plants so they won't get too moist and start rotting. The charcoal cuts down the normal but slightly nasty smells that can come along as the plants grow. Cut the nylon fabric to cover the charcoal. It, too, will help with drainage. Now it's time to add the soil (about four to five inches). Carefully add your plants, and seal. Keep your terrarium in a sunny place, but NOT in direct sunlight, as it's too much of a good thing and will burn the leaves. Too Cloudy?—if, after a while, the sides of the terrarium get very cloudy with too much moisture, just unseal the top for a while to let the moisture out. Wilted?—if the plants start to wilt, add just a little water and reseal. These instructions were adapted from an article on the Canadian Gardening Web site. Introduces terrariums, covering tools, supplies, plants, containers, and crafts that can be used to decorate a glass garden. While terrariums are included, they are only one of the amazing plant projects you can try. In Pet Bugs, Sally Kneidel shows you how to catch and keep crickets, mantises, click beetles, and many more kinds of insects. She'll also give you a close-up view of how insects interact with one another and with their environment. "50 unique projects offer fantastical inspiration alongside easy-to-follow instructions and ingredients lists. From the nature-inspired combination of blue-tinted echeveria and a milky-white shell to the darkly beautiful pairing of pyrite, black moss, and begonias, there "s a terrarium for every taste and style." Also available in print. Important! A terrarium that's home to a reptile should NOT BE SEALED AIRTIGHT. There must be good ventilation so the poor creature can breathe. In this article, you will learn how to use a lot of the same principles you would use to build a terrarium to build a home for your reptile. Great step-by-step instructions for creating a terrarium - that will also teach you some things about our Earth!